I can’t tell you how long I’ve been wanting to bake something. It had to have been weeks. I kept saying I’d do it some evening, once Lucas is asleep but, quite honestly, once he goes to bed my desire to do much of anything besides veg out on the couch is slim. So when I found myself with a little extra time while home sick yesterday…and then noticed the ripe bananas on the kitchen counter, I knew I finally had my opportunity. Now you guys probably already know…I’ve made plenty of banana breads in my day. Most of them were what one might call “healthified,” and unfortunately, many of them occasionally tasted that way too. So when I set out to make a new loaf of the good stuff, I knew I wanted something that wasn’t going to wind up spongy and overly “healthy,” but I also didn’t want one loaded up with a bunch of butter or oil either. Lucky for me, I found my happy medium. And not only that, but I decided to get a little crazy and dusted the entire coating of the bread with a sprinkling of cinnamon and sugar. The result? The most decadent of a slightly sweet and crunchy crust. But okay…I’ll stop pretending like I’m actually good at coming up with fancy words to describe my foods. How’s this: the bread is freakin delicious. Go make it like, now. Moist banana bread, without loads of added butter or oil, is coated with a generous sprinkling of cinnamon and sugar, making for a slightly sweet and delicious crunchy crust. Preheat oven to 350 degrees F. Spray a 9×5 loaf pan with cooking spray and dust with a light coating of white sugar and cinnamon. Combine bananas and yogurt in a small bowl and set aside. In a large bowl, cream together the butter and sugar. Beat in the eggs one at a time, then stir in the vanilla and banana mixture. Combine the flour, baking soda, baking powder and salt; stir into the banana mixture. Spread the batter evenly into the prepared loaf pan. Sprinkle top of batter with extra cinnamon and sugar. Bake for 1 hour, or until a toothpick inserted into the center of the bread comes out clean. Enjoy! Oh yum! So glad to see some of your amazing bread recipes back ! YUM! 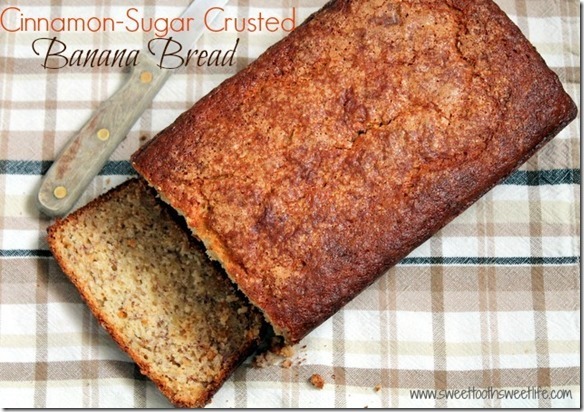 banana bread is a weekly staple in our house when bananas get too ripe, so i'll have to try this!! This looks fantastic! I bet your house smelled amazing while this baby was baking. I love the idea of coating the crust with cinnamon-sugar. Need to make asap! yummm, this looks delicious! I like that it's somewhere in between "healthified" and full fat. It's usually hard to find recipes that aren't one extreme or the other. I've got some bananas on the edge of death, so I might just need to turn them into this beauty! YUM. Yum! This sounds perfect with a warm cup of coffee and cream! I LOVE banana bread and so does my husband! I'm loving this version and I bet the Greek yogurt really makes it super moist. Oh this sounds so good!! Never thought to add cinnamon sugar to the top. And now I'm craving some of this delicious bread!! 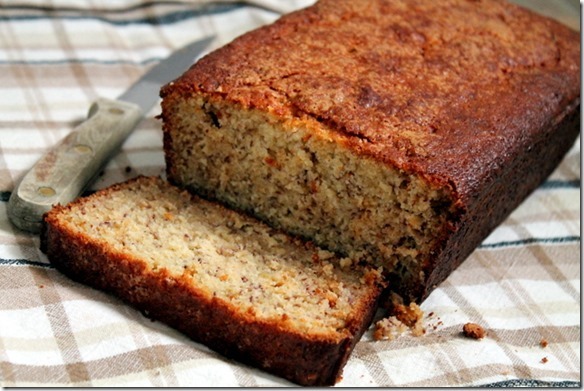 I've been craving banana bread lately - this looks great! I love the idea of a cinnamon sugar crust! Yumm...banana bread is one of my all-time favorites, and this one looks absolutely delicious! OH wow oh wow! 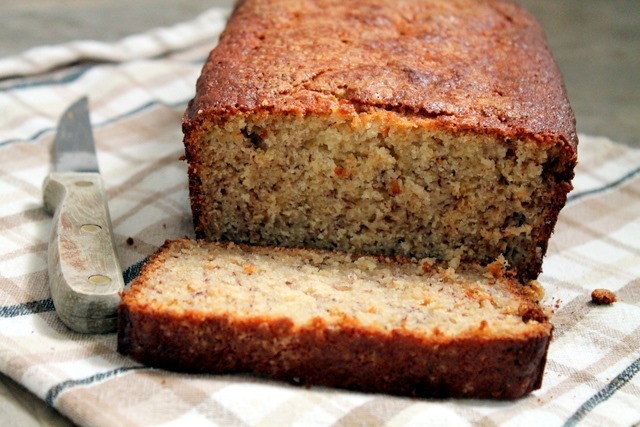 Banana bread is my favorite food group. Can not WAIT to try this one! A beauty!! 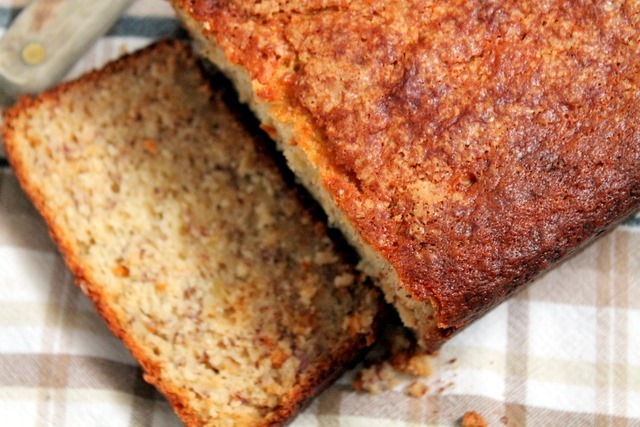 Banana bread without any oil or sugar just doesn't cut the mustard...perfect balance! I feel like it's been forever since I've made banana bread, and you've seriously got me craving a loaf! And I couldn't agree more about sometimes just needing the real stuff without any substitutions -- this looks like the best of both worlds. 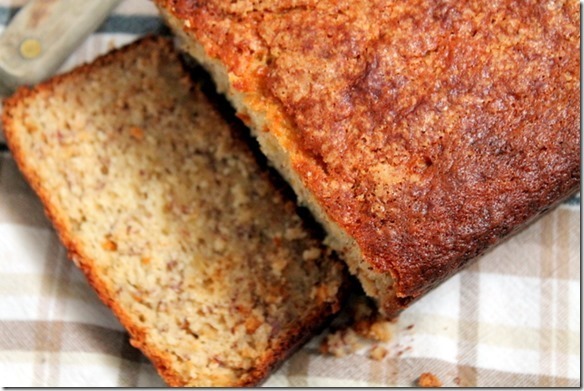 I love banana bread and with the cinnamon sugar crust, it looks even better. I love banana bread, but you've just come up with both a brilliant idea and a curse, because I have a feeling that banana bread will not be complete unless it's crusted with cinnamon & sugar! :-) Can't wait to make this! So, I saw this and immediately had to make it...or something like it :-) I didn't have all the right ingredients so I MAJORLY improvised using 1/3 c. sugar only, two strawberry Greek yogurts (strawberry/banana combo was great), coconut flour/gluten-free flour, coconut milk, and frozen blueberries. Sprinkled the top with powdered sugar and cinnamon....it was DELICIOUS!! Oh this looks heavenly!! I can't wait to try it. Banana Bread is great but with Cinnamon Sugar???? Even better! This looks like my kind of banana bread! I think we often try to "healthify" too many things and sometimes its best to not worry about it and enjoy it! THAT CRUST! Oh man, that looks so delicious! Thanks for the recipe! I love banana bread. I LOVE banana bread! Oh, it's been FAR too long since I allowed myself to put on my baker's hat…I think I'm overdue! I haven't made banana bread in months! Oh look at that, three brown spotted bananas sitting on my counter top. Think I'll let them brown up a little more and make some tomorrow evening. :) :) It's amazing right out of the oven with a smidge of margarine isn't it!! Hehehe, sometimes I try to explicitly describe a dish and it's just indescribable! So yeap~just make it, period. Hah! This sounds amazing! I love banana bread the classical way, but I always welcome exceptions. 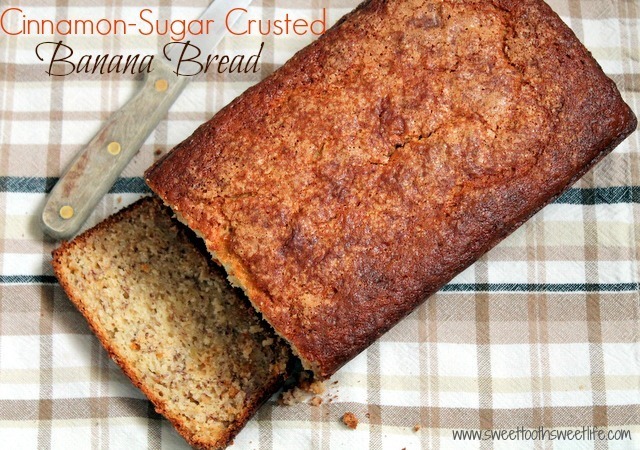 I have been seriously craving banana bread recently! I will definitely need to give this recipe a try. Mmmm, sounds like a winner to me! I am a huge fan of banana bread! I could eat the entire loaf so fast. This one looks amazing with cinnamon and sugar! Can't wait to try it! I love banana bread and the cinnamon top is a welcome plus.